Encore Acquisition Company (ticker: EAC) is a Fort Worth, TX-based company that develops oil and gas fields all over North America. In the Haynesville Shale, the company has 19,000 gross acres (12,544 net) in Louisiana in the Caspiana, Elm Grove and Greenwood Waskom Fields. 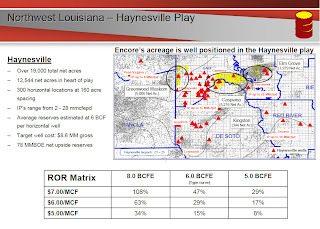 The slides below summarizes Encore's activities in the Haynesville Shale. 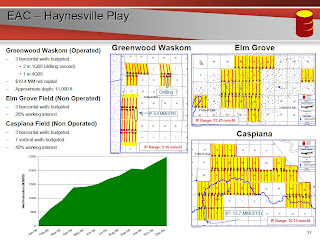 The company has one rig operating in the Haynesville Play and expects its activities in the area to pick up in 2010.